The BNU is a national public establishment, and the second most important library in France. A multidisciplinary research library for human and social sciences, the BNU is host of three million documents and preserves a unique cultural heritage. It has a triple vocation in terms of territorial coverage - regional, national and international. It receives the statutory deposit of printed works in Alsace, and is the benchmark documentary institution in the region for manuscripts and both early and contemporary printed works. It also keeps certain graphic, sound and audiovisual documents about Alsace. With its old collections estimated at nearly 1.1 million documents (pre-1920), including 6 700 manuscripts and 2 300 incunabula, the BNU has an important mission not only to conserve but also enhance the heritage. As a research establishment open to the general public, the BNU also has a role to play in enhancing the work carried out at the University of Strasbourg. As a multidisciplinary research library for human and social sciences, the BNU, with its collections estimated at three million documents, encourages an interdisciplinary approach. At the national level, the BNU is involved in a number of networks and projects (Couperin Consortium, SUDOC, etc). Apart from Alsace-related items, five other specialist documentation centres are still being developed, which makes the BNU the benchmark library in the fields of the German cultural area, religious sciences, ancient history, and European issues. 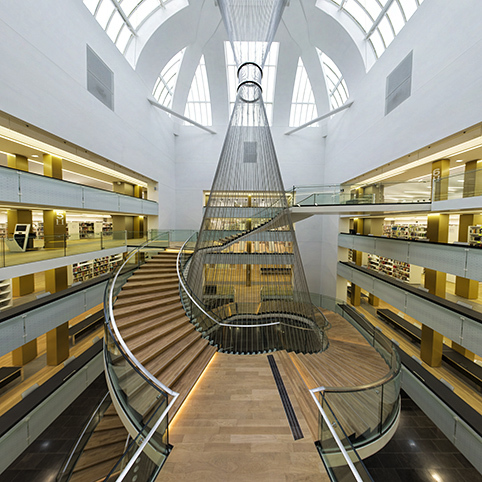 For the German cultural area and religious sciences, the BNU is both the centre for acquiring documentation and scientific and technical information (Centre d'Acquisition de la Documentation et de l'Information Scientifique et Technique - CADIST) and the partner centre of the French national library (Bibliothèque Nationale de France - BNF). The Catalogue Général is the first gateway to the BNU's collection of over 3 million documents, including 1 million offered to the EOD service.